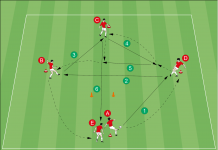 Home Soccer Drills Soccer Drill for Strikers – Avoid Offside! Soccer Drill for Strikers – Avoid Offside! There are some strikers who struggle with timing and perception when their own team is attacking. We are talking about that short essential moment, just before the decisive pass through a gap of the opposing teams defense. Instead of sprinting directly towards the goal, which often leads to offside, it is better to make eye contact with the passing player and run in an arc, looking for the right moment to then sprint into open space. 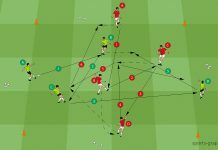 This easy to organize soccer drill helps your players to do just that and it is suitable for U-12 to U-19 players! A passes into the run of B, who is careful at the offside line (arc running) and sprints at the right moment the ball. D passes into the run of C, who is careful at the offside line (arc running) and sprints at the right moment the ball.